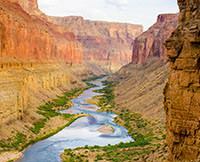 The packing list from Western River was dead on for our Grand Canyon rafting trip. Western's reservation staff was very accomodating and helpful. The materials were received promptly. The packing list was dead on. Guides were great! Very knowledgable, attentive, accomodating and always in a great mood. Great trip! Food was awesome and artfully prepared.